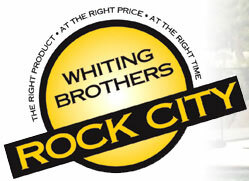 Whiting Brothers was founded in 1954. 50 years later our core business is landscape rock and soil products. We remain a friendly "family owned" and operated business. We offer DECORATIVE ROCK in various sizes, BOULDERS, SAND, PREMIXED SOILS, MULCHES, and SOIL AMENDMENTS. Whiting Brothers also operates a fleet of trucks for prompt customer delivery throughout Southern Nevada. We can directly ship large material requirements from various locations thereby saving you money. Whiting Brothers produces many of our FERTA brand soil products at our Vegas Valley facility. Our FERTA products are designed and blended to grow plants in our alkaline soil and hot, dry desert climate. Whiting Brothers has evolved decorative rock products that are durable, desert friendly, and affordable. We call these proven rock products DECOROCK. In addition to our website, we offer both indoor and outdoor displays at our Vegas Valley location. COME VISIT US AT OUR OFFICES WE'LL LEAVE THE DOOR OPEN FOR YOU! To provide top quality products, competitive prices, and superior customer service to each and every customer by creating an environment of honesty, integrity, respect, and value which allows the customer to gain a unique knowledge of the product and a level of comfort that are unmatched in the industry. The right product at the right price at the right time.